Ardern... will hope triumph over safety? Rarely published polling on how main party leaders are making New Zealanders feel may reveal what’s behind “Jacindamania”. Jacinda Ardern’s appointment as Labour leader has created a neck and neck general election contest with National. Now a Horizon poll finds Ardern making voters who are both registered and 100% likely to vote, feel significantly more hopeful (49% to 33%), excitement (39% to 21%) and pride (37% to 29%) than National Party leader Bill English. Mr English is making more people angry (33% to 16%) and afraid (29% to 26%) than Ardern. However, he is making them feel less nervous (34% to 36%) and concerned (36% to 42%). He is also making definite voters feel more comfortable (40% to 33%) and safe (41% to 31%). The findings are from a poll of 846 respondents, taken between September 9 and 14, closing a day before Ardern announced that any changes Labour might make to tax law would not take effect until after the 2020 election. The poll is weighted by age, gender and region to ensure it represents the New Zealand adult population at the last census. At a 95% confidence level, the maximum margin of error for the decided voter sample is +/- 3.4%. The poll complies with Research Association New Zealand’s code for political polls. Which are the more powerful emotions: negative or positive? Using data from the 2008 American National Election Studies, Christopher Finn and Jack Glaser of the University of California, Berkeley, Goldman School of Public Policy, found in a 2010 study that self-reported emotional responses to President Obama and Senator McCain (e.g. feelings of hope) predicted reported vote choice above and beyond party identification, ideology, and other predictors. They said that, “all in all, emotions can shape whether, and how, we decide to become active politically”. On negative emotions, Horizon’s research finds English evoking more anger and fear; Ardern more nervousness and concern. With positive emotions, Ardern evokes more hope, pride, excitement and slightly more confidence; English is seen as more comfortable and safe. There are differences by gender: Ardern makes a higher percentage of women than men hopeful and proud, while men feel more comfortable and confident with English than with Ardern. English makes a higher percentage of women than men angry or afraid, but paradoxically, more women and men felt safe and fewer felt nervous or concerned with English than with Ardern. In general, feelings about the two leaders follow party lines: intending Labour voters are more positive about Ardern than about English; intending National voters are more positive about English than about Ardern. However, the reactions from their supporters are not fully positive. Ardern makes 13% of those intending to vote Labour afraid, 20% nervous and 21% concerned. There is a similar result for English with those intending to vote National: he makes 14% afraid, 15% nervous and 22% concerned. Those looking to start a family or have another child, sell a home or retire in the next twelve months generally have slightly more positive feelings about English than about Ardern. Those looking to buy a house, save more of their income, change their jobs, start studying towards or complete a tertiary qualification, or move overseas, have slightly more positive feelings about Ardern than about English. 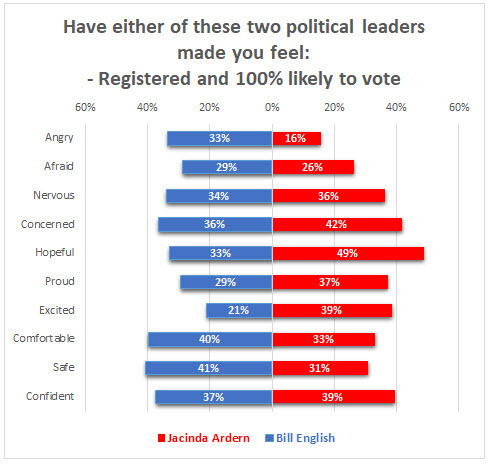 Those looking to start their first full time job have much more positive feelings about Ardern than about English. The feelings about the two leaders among those looking, in the next twelve months, to start a family or have another child, move to a new city/town/area or buy a home that is not their first home are generally more balanced. Full table results on how the leaders make New Zealanders feel by the activities they intend to take part in during the next year can be downloaded with top line results here. Comments are welcome at our Facebook page. For further information, please contact Grant McInman, Manager, Horizon Research, e-mail gmcinman@horizonresearch.co.nz, telephone +64 21 076 2040.